Capsulitis is not an uncommon cause of pain in Metatarsal area of the foot. The condition is frequently mis-diagnosed as ‘Metatarsalgia’. The term Metatarsalgia is not a precise diagnosis of any foot pathology. Translated from Latin, Metatarsalgia simply means ‘pain in the metatarsal area’. Considering there can be several different causes of pain in this area it therefore does not offer patients a precise diagnosis and is not helpful. The term Metatarsalgia is often used by practitioners where the precise cause of pain in the metatarsal and MTPjoints (Metatarsal/Phalangeal joint) has not been established. A joint capsule is a fibrous sheath that encapsulates a joint. Translated from Latin the suffix, ‘itis’ means ‘inflammation of’, and therefore capsulitis is inflammation of a joint capsule. Capsulitis is a product of inflammatory joint disease (arthritis). It is capsulitis affecting the 2nd MTPj (Metatarsal-Phalangeal joint) that is often more symptomatic than other joints in the forefoot with regard to its propensity to cause Metatarsalgia. The pain/discomfort is focused specifically over, and slightly distal (nearer the toes) to the 2nd MTPj. The pain is triggered by weight bearing activity and can be elicited by pressing the area firmly. The problem often begins following prolonged walking particularly when wearing a heeled, thin soled shoe. There is rarely any visible swelling or inflammation. Having diagnosed the problem we would then urge the patient to rest the affected foot and avoid any footwear that aggravates the problem. 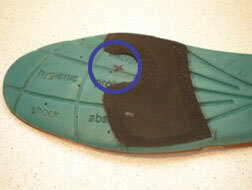 If the discomfort failed to improve significantly after a week then we would consider modifying the inlay in your shoe. This modification would redistribute pressure away from the affected knuckle (MTPj). The vast majority of capsulitis cases affecting the 2nd MTPj will settle if the patient has been compliant and rested the foot and worn running trainers with the modified inlay in. If however, the patient continued to experience significant discomfort despite being compliant, then we would strongly urge the patient to consider a Cortico-steroid injection into the affected joint. The steroid solution (Methyl-prednisalone) once in the joint will settle the inflammation within it. Do not confuse a steroid injection with taking steroid tablets. A steroid injection has no long term undesirable side effects on the body and is perfectly safe. A steroid injection is a commonly undertaken treatment at our practice, particularly for capsulitis and can be very effective in relieving the discomfort. The injection is quick and simple to undertake with minimal discomfort (the area is numbed with a local anaesthetic first).